To stay relevant to donors and fundraisers alike, AFP is taking a comprehensive look at barriers to professional equity. Leading the charge with the IDEA Impact program, AFP is creating resources to help tackle the issues it identifies, nurturing a diverse, inclusive and equitable fundraising profession. The AFP IDEA Impact program will use a phased, multiyear approach to create initiatives focused on diverse communities. To remain up to date on the latest IDEA work, visit the IDEA website. The Women’s Impact Initiative (WII) is an 18-month initiative to assess, address and highlight the specific issues and challenges that women in the fundraising profession face. To access research materials, share our organization's story or find out ways you can get involved, visit the WII website. Thanks to the dedicated efforts of AFP MB members, our chapter is once again a certified Friend of Diversity for 2019. The Friends of Diversity Designation recognizes those chapters who have accomplished many of the key objectives outlined in the Advancing Inclusion and Influence strategic goal. Your local AFP MB chapter is looking for interested volunteers to join its IDEA & Ethics committee. Help to shape your organization and ensure it reflects the diverse communities we serve in Manitoba. Interested in learning more? 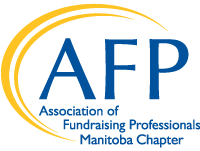 Contact DerekY@afpmanitoba.org. AFP’s Strategic Plan is the blueprint for organizational growth and success in the future. For the strategic plan to be effective, it must be implemented through a partnership between the International Headquarters and the local chapters. As each chapter contributes its part to the overall Strategic Plan, AFP will meet its goals and continue to advance philanthropy and the fundraising profession around the world. One of the specific goals in the plan is AFP reflects a diverse and inclusive community, evolving and enhancing our global influence and mission impact. The Friends of Diversity Designation recognizes those chapters who have accomplished many of the key objectives outlined in the advancing influence and inclusion strategic goal. This designation encourages chapters to perform specific activities designed to increase diversity within fundraising and public awareness of the importance of philanthropy in all cultures.